Bitcoin price predictions for 2017 just met with reality as one bitcoin hit $1000USD on the first day of the year! This is expected because bitcoin has built in features to encourage its price to rise over time, and given the growing acceptance of both non-government currencies and digital currencies. Understanding the anti-inflationary features of bitcoin is essential to understanding its price. Bitcoin’s price back in May 2016, weighed in at “only” about $450. In the run up to the new supply for mined blocks being cut in half bitcoin’s price began to rise, breaking the $750 mark in mid-June. The price has been showing signs of continued increase since then. READ ALSO: How to Turn 0.03 Bitcoins to 128 Bitcoins every month. The Bitcoin reward for mining won’t be halved until early July in 2020. Regardless, the bitcoin’s price will likely continue to trend up through 2017. This doesn’t mean that bitcoin won’t suffer setbacks, but the overall trend line will likely point up through 2017. As national governments continue to struggle and the global economy is exposed to high risks, it’s likely that an increasing number of people will look to bitcoin and other alternative currencies/investments. Bitcoin has taken on the mantle of a “safe haven” investment, due to the fact that it is free from government interference, and that supply is limited. Governments can increase the money supply at pretty much any whim, thereby decreasing the individual value currency units. Bitcoin’s supply, on the other hand, is already set and cannot be changed. In Nigeria, Bitcoin has seen growing adoption in Nigeria, especially since the economy fell into recession earlier this year following much lower global oil prices. This has seen many Nigerians going into several bitcoin businesses in recent times. Hence, the federal government has announced it will soon legalize the use of bitcoin for business transactions. If the global market grows more turbulent in the months ahead (which is quite likely), people may start ditching their traditional currencies in favor of bitcoin. This will lead to increased use of bitcoin, and as more people use the currency, demand for it will rise, and prices along with it. Juniper Research, a respected research firm, predicts that bitcoin transactions will triple in 2017, reaching $92 billion dollars. Juniper notes several factors that should encourage the increased adoption of bitcoin in 2016 and through 2017, including the fragility of the Chinese economy, the Brexit vote and on-going issues in Europe, including high unemployment and bad public finances, and numerous other issues. Daniel Masters, a co-founder at the multi-million dollar bitcoin hedge fund, predicts that bitcoin will hit $4,400 by the end of 2017. Masters believes that bitcoin adoption will continue to increase, and more companies will accept it as payment. This increased adoption will be propelled investments in blockchain technology. Alan Donohoe, the founder of the Bitcoin Association of Ireland, made a more down to earth prediction earlier in 2016, suggesting that bitcoin will rise to about the 800-pound mark. This would put bitcoin up above the $1,000 USD mark, a price point that bitcoin last approached (and in some cases broke) back in 2013. SpectroCoin CEO Vytautas Karalevicius argues that bitcoin transactions will increase 10 times. If this proves to be accurate, Karalevicius believes that bitcoin will rise to about $1800 to $1900. This is based on the correlation between bitcoin turnover and price that we’ve generally seen so far. At the beginning of 2016 an analyst with Wedbush Securities, Gil Luria, predicted a price of about $600 in 2016. As of November 2016, Luria’s prediction is pretty much spot on as bitcoin started trending at about $600 that period. Luria believes that bitcoin will continue to grow as a transaction medium, another prediction that largely appears to be correct. For 2017 Luria predicts that bitcoin’s price will once again double. In fact, Luria believes that bitcoin’s price will essentially double all the way up until 2025, which would mark an increase of 4,500%! If this prediction turns out to be correct, investors could generate massive returns. Vinny Lingham, the CEO of Civic, predicts that bitcoin could hit $3,000 in 2017. Lingham’s predictions are especially notable because he’s made a name for himself by being willing to state contrarian views, and has accurately predicted drops in bitcoin’s price. Now, however, Lingham believes that 2017 will be very good year for bitcoin. First, venture capital investments in bitcoin and blockchain technology have now topped a billion dollars, and as more companies invest, use and acceptance of bitcoin will likely increase. Second, a “short squeeze” may be forming as people who have shorted bitcoin may be forced to buy bitcoins to repay their short bets. Third, bitcoin will continue to enjoy natural inflation due to its limited supply. Lingham also suggests that an arms race could break out as governments decide to start to buy up bitcoin. So far, most governments have shied away from bitcoin, but as adoption increases, they may get into the game. Bitcoin price finally breaks the $1,000 today, first January 2017. This means that bitcoin’s price predictions so far, to double from where it is trading in November last year, has finally come to reality. 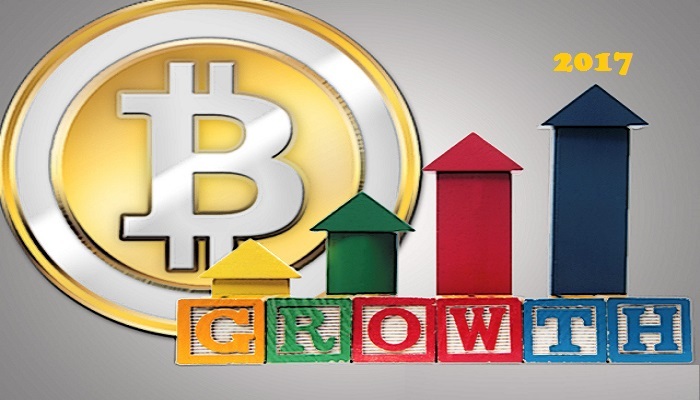 There are several key factors at play as bitcoin price hits the ceiling. First, the global economy is on tenuous grounds, and bitcoin is a safe haven currency/asset. If the global economy does hit a rough patch, which is very plausible, then bitcoin and other safe haven assets and currencies will enjoy a boost. Second, many governments, including Japan, and the Eurozone, have been engaging in quantitative easing. This means that they are increasing their money supply by creating money and buying up new assets. This increases inflation and encourages people to invest in things like bitcoin. Third, an increasing number of companies, and especially retailers are taking interest in bitcoin. Others are also interesting in blockchain technology. As interest grows, adoption will spread, and as more people use bitcoin, prices should increase. So while $5,000 and other numbers are perhaps a bit overly optimistic, $1,000 has been achieved. And if a major event does unfold, such as a global recession, or a major company like Amazon announcing that it will accept bitcoin, who knows those $5,000 dollar predictions might not look so overzealous after all. If you have any thoughts about Bitcoin’s price for 2017 I would love to hear them in the comment section below.